Knit for an online friend whose family is going through some major upheaval and shake-up, I enlisted the help of Lisa and a double fistful of other knitters and crocheters to help me create enough blocks for a big Blanket of Love. 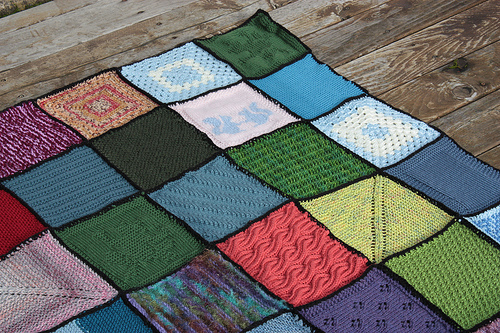 The squares came from as far away from Japan, all carefully stitched with love and good wishes for speedy resolution of the family’s sadness and stresses. 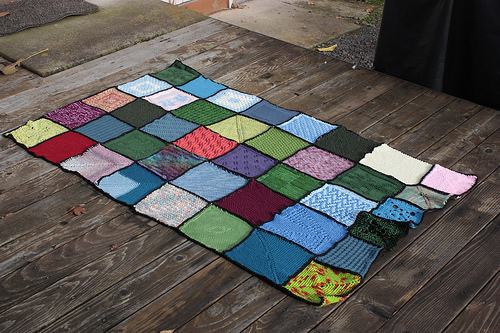 Lisa and I seamed all of the squares together, zip-zip-zip, edged the whole thing with a black crocheted edging and sent it to it’s new home in the Midwest where we hear it created quite a stir of joy. We live in an amazing time, where people who are scattered all over can create such strong, amazing bonds and make a real difference in each others lives. I am proud of being able to corral a little bit of this to support someone who needed a little bit of reaffirmation that there is good in the world. I am proud of every person who set aside their own worries, cares, wants and projects to take the time to help with this (one woman squeezed a square in the week before her wedding!) It’s a great thing sometimes, this crazy internet. I had no idea that you had been doing this. It’s beautiful and so thoughtful.